Revista de los Teosofos Espanoles / Revista Teosofica: Organo Oficial de la Sociedad Teosofica en Espana / Revista Teosofica: Orientalismo, Gnosticismo, Kabbalah, Ocultismo / Revista Mensual de Sintesis Espiritual, Filosofia, Religion, Sociologia, Metapsiquica. Madrid, then (1931-1932) Barcelona, Spain. Language: Spanish / Esperanto / French. Publisher: Josep Xifre y Hamel. Editor: Jose Melian; Francisco Brualla; Mario Martinez de Arroyo. 1/1, January1893-1914; 1924-1926; 1932. 24-60 pp., 12 pesetas a year. Title occasionally printed in Greek capitals. The journal is intermittently dated with the year of the Kali Yuga (dating the beginning of that event precisely to 3152 B.C.). The journal was stopped and then restarted several times, with only the name and Theosophy to connect the ventures. 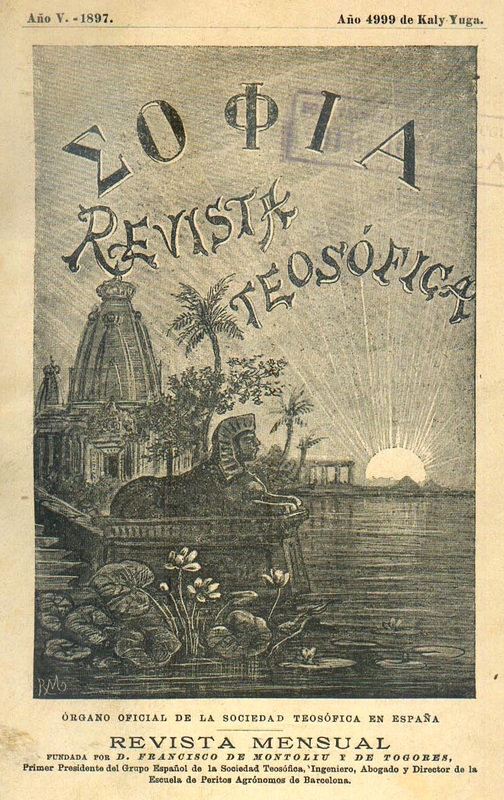 For unknown reasons, the title page of the collected volume of Sophia for 1901 and 1902 bore the name Teosofia, Revista Teosofica: Orientalismo, Gnosticismo, Kabbalah, Ocultismo, becoming Revista Teosofica Orientalismo Ocultismo in 1903. The change does not appear to have affected the contents. This was the second Theosophical journal in Spain, after Estudios Teosoficos. Xifre y Hamel was a wealthy Spaniard whose desire to learn the archaic wisdom preserved only in inaccessible places first led him to Paris, where he studied Sanskrit under the fraud Louis Jacolliot. Returning to Spain, he read of Theosophy in Louis Dramard's Le Lotus and wrote H.P. Blavatsky in London. She put him in touch with Francisco Montoliu y de Togores, who had learned of Theosophy by reading La Revue Theosophique and had written to introduce himself to her, and then taught himself English in three months in order to read Blavatsky's works. The two then started the first Theosophical groups in Spain, first in Madrid and then, when Montoliu moved to Barcelona, in that city. See Mario Roso de Luna, Del arbol de las Hesperides: Cuentos Teosoficos Espanoles (Barcelona, Spain: Biblioteca de las Maravillas, 2006), 14-16. Montoliu was tireless in the cause, translating first Isis Unveiled and then Light on the Path and other Blavatsky classics. He also translated Bulwer Lytton's The Coming Race. The first number of the journal proclaimed that it had been founded by Montoliu, but he died in the year before it started and the reference probably indicates that the journal saw itself as the continuation of Estudios Teosoficos which Montoliu had begun in 1891. The journal in its early days was heavy in translations of English works by Annie Besant, Blavatsky, G.R.S. Mead, W.Q. Judge, et al., but eventually made way for occult topics generally (until it fell into the pattern of the official Theosophist published at Adyar) and for more Spanish Theosophists, most notably Mario Roso de Luna, on whom see the note under Hesperia. Montoliu died in May 1893 and the journal continued under the control of Xifre who had always supplied the financing. For a time, beginning in September 1909, a supplement to the journal was published in Esperanto. The issues in the years leading up to World War I contained photographs of current Theosophical leaders, like Charles Blech (August 1913). The issue for October 1893 carries the story of the expulsion in 1892 of the Count de Das--better known as Alberto de Sarak, Count of Das--after he had defrauded and almost destroyed the Barcelona branch. On Sarak see the note under The Radiant Centre. Some issues of the journal in the 1920s bear the ominous warning: "Este número ha sido revisado por la censura." In May 1932 the journal was combined with El Loto Blanco, also published in Barcelona, to form Teosofia. Archivo General de la Guerra Civil Espanola; Rama Arjuna, Barcelona, https://arjunabarcelona.files.wordpress.com.